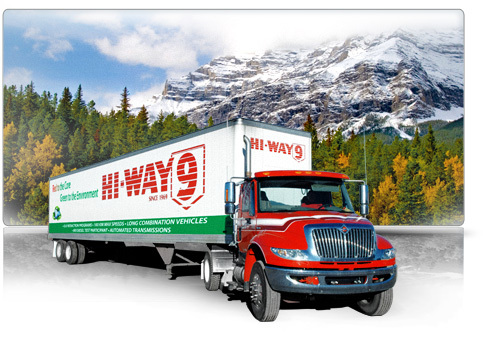 We understand how fashionable it is to be green but its nothing new at Hi-way 9. We started back in 1992 by limiting the speed of our vehicles to 100 km/hr. We followed that by utilizing long combination vehicles (two loads/1 power unit) in 1996 and implementing a “no idle” policy in 1998. Increased load factors to minimize miles travelled. More freight, less trucks. Proper spec trucks, we are LTL carrier so loads are lighter, hence we can use smaller horsepower and single axle trucks and trailers, less rolling friction. GPS tracking, making for more efficient routes travelled. Use of aerodynamic technologies and short wheelbases to reduce wind drag. Automated shifted transmissions so engine is running at optimum fuel efficient range. Partcipants in Fleetsmart and NRGCan. Implement of Espar Diesel heaters for better starts, reduction of energy used. Installation of trailer skirts where feasible to achieve fuel economy improvements. Waste oil heaters will be going into new maintenance facility for additional heat and use of our waste oil we create.